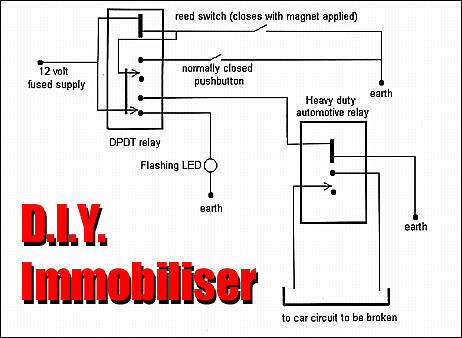 Build your own car immobiliser that is simple, cheap and very, very effective. This article was first published in December 1998. Since that time it has proved to be enormously popular. However, many people who like the idea do not have the electronic skills to build it. If you are not familiar with double pole relays and the like, don't try to build this project! If wiring up a couple of relays doesn't worry you and you can handle a soldering iron and a multimeter, this immobiliser is for you. Most of these bits and pieces you can get from an electronics shop. Like all immobilisers, this one shuts down the car's EFI or ignition system. But what's different about ours is that if the thief steals your keys (with the remote control attached), he still can't drive away with your car. That makes it just about unique! 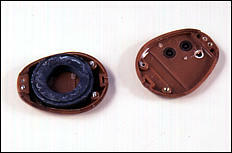 The guts of the remote transmitter case are removed and the magnet is placed inside. The circular magnet from a tiny speaker has been used here. When you enter the car, you casually swipe the transmitter case past a special place within the car's cabin. This place might be on the centre console, a part of the dashboard - pretty well anywhere. 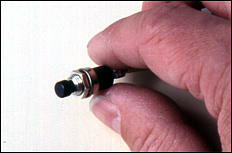 Hidden behind the area that you swipe is the reed switch - a switch that is sensitive to magnetic fields. 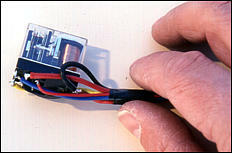 The swiping triggers the reed switch that in turn switches off the immobiliser. Because the reed switch is located behind the plastic of the dash or centre console, there's nothing to see. The swiping movement can be quite natural - part of your hand movement as you put on your seatbelt or settle yourself in the seat. 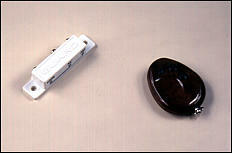 That means that even if a potential thief is watching you closely, he doesn't get any clues.The remote (at right) triggers the reed switch (left) whenever it comes close. Only you know the location of the reed switch! When you want to arm the immobiliser, you press the button. The pushbutton can be in complete view - the thief gains nothing by ripping it out and either disconnecting the wires or bridging them. When you press the button, the on-dash LED starts to flash, indicating the car is now immobilised. It also reminds you to switch off the system when you re-enter the car. The diagram shows the circuit that is used. Click on it to enlarge. You want to go somewhere, so you swipe past the open reed switch with your transmitter case. This momentarily closes the reed switch, allowing power to flow through the DPDT relay's coil. It pulls in, with the second coil power supply path through the top contact causing it to latch - that is, stay pulled in, even after the reed switch has opened. The bottom contact of the DPDT relay then feeds power to the heavy-duty relay, causing it to pull in and complete the car starting circuit. You drive to your chosen location and want to disable the car. A single push of the normally closed pushbutton breaks the latching circuit of the DPDT relay, causing the relay to open. In turn, this stops the power feed to the automotive relay, and so it also opens, disabling the car. The LED starts to flash showing the immobiliser is set. The system can be installed in three separate parts: the DPDT relay, the heavy duty automotive relay, and the reed and pushbutton switches. We mounted the DPDT relay in a 35mm film canister. The relay that we used fitted neatly into the canister, with the wiring passing through a hole drilled in the cap. The canister was mounted under the dash within the wiring loom. 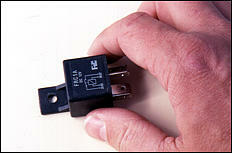 The heavy-duty 12 volt relay should be mounted close to where you break the vital starting circuit. A number of different approaches can be used. 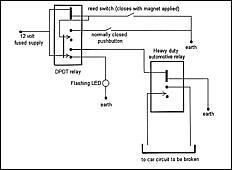 In an older car, inserting the relay in the low tension ignition coil power feed will prevent the car starting, as will open-circuiting the ignition key starting signal to the starter motor solenoid. However, if you do the latter, the car can still be "jump started" - not what's wanted!. If there are high current fusible links used for different circuits, it's easy to keep pulling the links until the car is as dead as a doornail and then wire the relay to open this circuit. Finally, if your car has an electric fuel pump, the immobiliser can disable this. However, note that both EFI and carby cars will still start and run for a short period even with the fuel pump stopped. This might be just enough time for the thief to drive to the middle of the nearest major road intersection before the car dies! The 'arming' pushbutton can be mounted anywhere on the dash. Note that if this button is accidentally pressed while you are driving along, the engine will immediately stop. Thus you should mount it where accidental activation is impossible. The location of the reed switch is very important. It should not be awkward to access when you are seated and should also not be so close to the ignition switch that the immobiliser is disabled by the thief without him realising it! Its location is best picked when you are seated in the car. 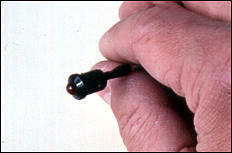 Attach the reed switch to the inside of the plastic panel using a smear of Liquid Nails or similar adhesive. The most complex part of the system is the wiring of the DPDT relay. We built the complete system on the bench so that we could easily check that everything worked. With the system mocked up, the flashing LED should work as soon as power is connected. Swiping the hand control past the reed switch should switch off the LED, causing the DPDT and heavy-duty relays to click. Pressing the button should cause the relays to again click and the LED to start flashing. Once the system is operating on the bench, you can install it in the car.